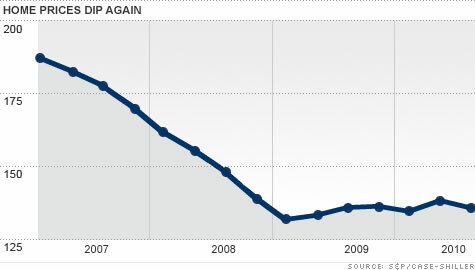 December 4th, 2010 9:39 AM by Lehel S.
NEW YORK (CNNMoney.com) -- U.S. home prices fell 2% in the third quarter after having gained steadily since early 2009. The S&P Case-Shiller Home Price Index has recorded gains in four of the previous five quarters, including a 4.7% jump between April and June 2010. That leaves national home prices down 1.5% year over year and off 2% compared to the second quarter, according to the Index, which was released Tuesday. David Blitzer, chairman of the Index Committee at Standard & Poor's, attributed some of the decline to the end of the government program that paid tax incentives to homebuyers but he pointed to other problems weighing on the housing market. "The national economy is certainly the number one issue for housing," he said. "Additionally, there is a large supply of houses on the market and further, hidden, supply due to delinquent mortgages, pending foreclosures or vacant homes." The S&P/Case-Shiller 20-city index, which is calculated monthly and looks just at major metro areas, also recorded a substantial decline. In September, the index fell 0.7% compared with August. The 20-city index is down 28.6% from its July 2006 peak. Just two of the 20 individual markets the index tracks recorded gains for the month: Washington, D.C., home prices rose 0.3%; and Las Vegas was up 0.1%. Brad Hunter, chief economist for Metrostudy, which provides housing market information to the industry, believes the decline in U.S. home prices is likely to continue. "We still have downward pressure on home prices," he said, "that stems from two things: supply and demand." The inventory of homes is high with nearly 3.9 million on the market in October, according to the National Association of Realtors. That means it would take 10.5 months to sell through all of the current inventory. In a normal market, there is usually a six-month supply. Plus, there's a massive shadow inventory of homes waiting in the wings. These are homes that are deeply in the foreclosure process or even repossessed by banks but not yet put back on the market. "The juggernaut," said Hunter, "is the millions of homes that could be put on the market at distressed prices." Meanwhile, the sluggish economy has kept demand for homes from growing. Not only has unemployment remained stubbornly high but many employed workers are worried about losing their jobs. And if you're worried about your job, you're not buying homes. Joseph LaVorgna, chief U.S. economist for Deutsche Bank is optimistic about the job situation. "The recent news has been encouraging," he said. "Tax receipts and jobless claims indicate that household employment prospects are rising sharply. If the labor data improve significantly, we would expect this to buttress home prices."